Disclaimer: This is not an official Marillion web site. It has never been approved or probably even read by Marillion. Nothing said here is anything more than opinion. 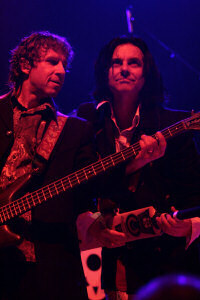 To visit the official Marillion site click on the banner. If you have any comments about the site or would like to get in touch for any reason please use the Feedback form. Because of the spammers I'm not publishing my mail address but using the form you will reach me. We would also love to hear from anyone with their own site so that perhaps we can do something about adding a link to your site. 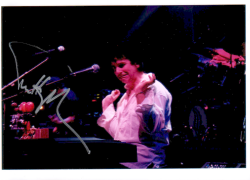 I started writing this page purely to document our Marillion going experiences. I quickly found myself getting more involved in side project such as Kino and other related concerts such as Fish. I also found that my love of photography was revived and now feel I've missed a concert if I've not been able to photograph it. Some people cannot understand why I want to photograph the concert and assume I'm missing the concert. For me it is about knowing the work of the artist so that you can anticipate good moment (such as Steve throwing his head back and going to that place he goes to during a guitar solo, or H declaring that he is "perfectly sane" while displaying quite the opposite). 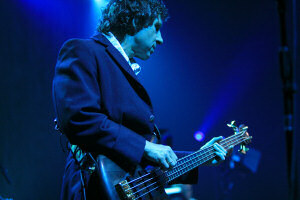 You will find links to loads of my photographs of Marillion, Kino, and Fish ( look out for the flashing camera icons ). You may notice that I'm not reviewing the concerts from a musical point of view. Firstly I would not presume to tell a group of people as experienced as Marillion how to play but I'll let you know if it's ever truly awful. Secondly, for me, the concert going experience is as much about the relationship between the audience and the artist as it is the actual content of the concert. In all the concerts I've been to so far I've been able to really let go because I know that almost everyone else is also letting go. I don't need to feel self conscious because (and I've seen this with my own eyes) it's the people standing still on the outskirts not those in the scrum in front of the stage that feel awkward. Let me put it another way, Marillion would have to try really hard to make me not like their music but all the audience need to do to put me off a show is to sit quietly and clap politely between songs. I hope that makes as much sense to you as it does to me. Well it's certainly been an interesting year for Sue and myself. We suddenly had an almost religious reawakening to the music of Marillion and I'm fairly certain that most of our friends think we've gone mad. Well if this is madness then bring it on. I think this probably all started because the band wanted the fans to stump up £30 to buy the new album Marbles. Not that you could actually listen to any of it because it was not ready by a long way. The incentive was to get your name in the credits and to get your hands on the album a little earlier than those that waited to see what the end result was. Well the result has been worth waiting for (even if the wait was longer than predicted). Our initial following of the band started in the early eighties when Sue's brother David was a big fan. His liking of the band rubbed off on Sue and then when Sue and I got together in Bangor it rubbed off onto me. This was then further reinforced by sharing a house with a Marillion fan and a Genesis fan. We both lost touch with the band after University and before Fish left. Not that we didn't keep buying the albums, we had a fairly full catalogue, it's just that somehow seeing a band live adds something to the music you listen to when you are not at a concert. We've been to comparatively few concerts this year. Well when I say few it really is against the background of the more dedicated long term fans who manage to turn up at virtually every concert. I really can see why this happens, I was seriously considering going to Dublin and then Belfast but a friend decided to get married that weekend. I suggested we go to Mexico for our 10th wedding anniversary which would have been nicely timed to coincide with the guys playing that city but Sue took the view that it was perhaps too loyal (I have to say that was September and at the time of writing (November) I think she has perhaps reassessed her loyalty and we would have been going). 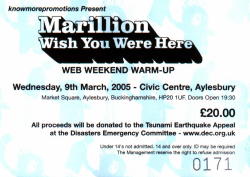 This was our first concert with Marillion for over 15 years and apart from the strange location (inside some curved roofed football pitch or cowshed depending on who you talk to) it did not let us down. We were scratching our heads over the fact that everyone seemed more interested in talking to each other than listening to the band they had paid good money to see. I started to assume they had given away a load of free tickets just to boost the crowd and that these were the people making the noise. However this was not the case, it just appears to be a Dutch thing really. However we left the concert delighted or even amazed at the length of the show. They performed a huge chunk of Marbles, went off stage briefly and reappeared to do another 90 minutes of the older stuff. We took Mark along (a friend living in Herenveen) and I think he was expecting Fish material. As it turned out there was no such old material. In my opinion that is a good thing but clearly loads of the fans still turn up in the hope they will hear some of the old material. After the show Sue and I were really impressed and I just wanted to listen to more Marillion. Stupidly we did not bring anything with us to play in the car, that was the last time we made that mistake. Despite being as far from the stage as it was possible to get we enjoyed this concert as much as the others. I was sat on a piece of concrete window ledge so far up that the band looked tiny. It was great to see the guys after what seemed like an eternity. For the second evening we took a few friends along, the confirmed rock addict Meirion and friends, who now live in New Zealand, Neil and Claire. Everyone said how much they enjoyed the show and we had far better seats. H let out a teaser about being dropped in for the next show, the next day in Germany. I woke up early, I was pleading with Sue to go to the concert but she was doing a good act of not wanting to go. I resorted to playing some of our favorite tracks to get her in the spirit and by 10:00 she had relented. We booked a hotel, programmed the navigation system and set off for the three hour drive to Cologne. The show was awesome. Before the show we had seen H showing his family round the show but decided to keep a little distance and give him the privacy I'm sure he craves on such occasions. H's entrance was just so OTT you had to see it to believe it. Firstly sky divers descended out of the sky, with the hint we'd received the previous night I was asking myself was it possible that H was strapped to one of these guys. Then a helicopter started to circle the event and it soon became clear that this was where H was. They delivered him to a waiting jeep which drove him to the back of the stage. All total unnecessary but totally fabulous to watch. They really must make a video of this even if it's only an extra on some other DVD. Wow what a show. This was an acoustic set without Ian or Mark. Not only was the support act Azis and Dal of the H' Band but H himself took part during 'really like'. Sue and I got there early and managed to grab a place on the front row, if I have my way we will never stand anywhere else again. They promised to join us at the bar after the show and they kept their word. It just shows what a trust worthy crowd us Marillion fans really are. Well it was around 2am before we got away from the venue and to our delight we found that H was staying in the same hotel as us. To add to the experience we met up with a number of Brits who could not be more friendly. I'm sure we will keep in touch and certainly see one another at future gigs. Damn, damn, damn. Sue was taken ill during the support act and we wound up in Hospital without hearing any of Kino. We eventually got home by about 1:00am and then to add insult to injury we heard that H had turned up to give Pete a bit of support as part of the crowd. We are both kicking ourselves at having missed what was apparently a great show. Still Sue has made a good recovery from the mystery illness and has promised not to make a habit of this. 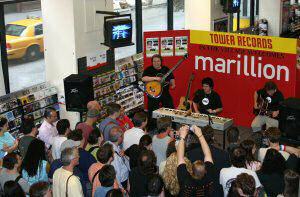 The year of our first Marillion convention and the Los Trios tour. And we get to see the guys at a festival virtually on our doorstep. Aditionally we get to see Fish even closer to home and revive an interest in his work. Huge thanks to the web holland and everyone who appeared on stage. It was a long but very entertaining evening . We got in around 4:30 after a bit of a delayed start and managed to secure a great place at the front just in front of Pete's usual spot. The event started with a short set from Aziz and Dal during which H' came on stage to perform Really Like. After that there was a film followed by questions to the band from the audience. We were told what to expect from the three nights at the convention in a bit more detail than we'd heard before. After that there was what seemed like a never ending lottery draw. Then John Mitchell and John Beck performed a few Kino numbers and some It Bites and were joined by Pete for the last few songs (we are now really gutted that we missed their first night because they really were excellent). 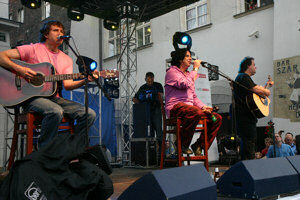 Finally the highlight, Marillion (less Mark and Ian) came on to perform a really well received acoustic set. They were joined by Aziz and Dal for the second to last song and finally the two Johns came back on stage making the Tivoli stage seem incredibly packed. After the show they came off stage and mingled with the crowd. We left at around midnight (about eight hours after arriving) and Pete was leaving at about the same time. The others were still going strong. The show was the first time I've been able to try the new camera (Canon 300D with the EF-S 18-55 lens) in such concert conditions and I think it was worth the money. The flash that I bought went almost unused and certainly never during the show. However I did feel a little under equipped when compared to the guy from the web France who was parked next to me (apparently size does matter). The pictures are a little grainy and that's because to get the pictures in such low light I shoved the ISO rating right up. I have never seen so many people in one place wearing the same coat. I thought I was the only one with the fleece until Aylesbury and then all of a sudden everyone was wearing one. We had arrived at our hotel to be told that we had to be moved to another hotel because something was on in town and they were fully booked. When we arrived at that hotel they too were perplexed as to what was happening. Clearly even in Aylesbury Marillion are a well guarded secret. We both enjoyed the warm up gig although it was a little short and it did end rather abruptly with no encore which was unusual and left us at a bit of a lose end. H made a couple of mistakes but this kind of added to the enjoyment as Pete came over to prompt him. They played a huge chunk of Marbles and then some older stuff to follow and all the proceeds went to charity. I have a great photo of H hands in the air looking afraid to touch the keyboard, I printed this and asked him to sign it and he did. We met up with some of the people we had previously seen in Barcelona which really made the event more enjoyable. The gig gave me the chance to try out the new Sigma 20mm f1.8 lens and being positioned right in front of Steve for the first time I managed to get some great shots of him playing. One of these I managed to get signed at the weekend. My Brother-in-law and three close friends joined us for the weekend and I think it's fair to say that we all enjoyed the weekend although perhaps for those that were less familiar with the more recent Marillion work some of the shows were less enjoyable. As had been promised in the Tivoli, Friday was a almost pure Marbles set, Saturday was an up beat evening, and Sunday was more chilled out. Naturally I loved the Marbles set and true to their word they played ocean cloud, the Saturday show was great and if H is to be believed the room downstairs needed to be evacuated because they believed the ceiling was close to collapse, Sunday night was filled with the slower numbers and although this was not to everyone's tastes I found it a really nice way to wind down especially as they played what might be my favorite song 'A few words for the dead' ('or you could Love' brilliant!). The other entertainment for Saturday was the swap the band section. This went down really well with everyone and some very talented people appeared on stage replacing Ian, Steve, H and at times the entire band. H's daughter Sofie, sang Angelina and H could not contain his pride. Two of H's friends also appeared performing 'waiting to happen' a father and daughter duo from the Armstrong family. I was later told that this duo was none other than the son and grand-daughter of one Neil Armstrong. The final swap the band spot included a mystery song sung by the lead singer of the Forgotten Sons the scottish cover band. The mystery song turned out to be Fugazi and the crowd went wild. Sunday night included a final to the trivia competition in which the best team went head to head against the band. With a few last minute changes to the rules the challengers won but it was all done in the spirit of entertainment and we all had a great time watching H squirm during the 'what comes next' competition when he was excluded from answering and none of the rest of the band could demonstrate much knowledge of the lyrics. One thing that struck everyone we have spoken to and that was the friendliness of everyone. In every situation people demonstrated a really good natured attitude towards everyone else. H had started the weekend with a little speech in which he likened those present to the band's family and it really did feel like a very large family party. Personally I can't wait for the next one but I appreciate that for people who have saved up hard to travel a long way it would be all too easy to make this less special by holding it too regularly. A project I'd set myself was to create a kite carrying the marble logo. Lucy was kind enough to give me the go ahead to use the logo and gave me some resources that helped. I managed to get the guys to sign the kite. This was done in stages because I'd caught up with H, Pete, and Steve at the 20th anniversary bash in Utrecht and then at the signing I managed to get Ian and Mark to complete the set. 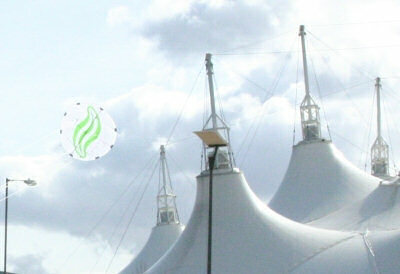 The picture here shows the kite being flown from the beach with the top of the Butlins tent in the background. I now have another project and that is to make the kite stable because what this still picture does not tell you is that within about 15 seconds of take off the kite becomes unstable and spirals out of control to the ground. On the photo front I took over 1000 pictures across the four days. Not all of these are good and many of them will never be allowed to see the light of day. However I'm quite pleased with some of the shots and in particular the new lens (A Sigma fixed 20mm f1.8) really helped me get some great shots of Steve. Sadly that lens is of little use if you are not parked right in front of your subject and I found that during the weekend I was resorting to using the 18-55mm and an old 100-300mm zoom. The drawback of this is it's small aperture so it was very difficult to get good shots from the distances I was at. However I met a couple of people who demonstrated their great nature and loaned me their excellent image stabilised 70-200mm zoom lenses. I tell you taking perfect shots with this lens from the back of the room is a real joy and I know what I want for my next Birthday. We went to see Pete and the rest of Kino supporting Spock's beard. It was a great show and the reception they got from the audience started to make me think that we might see a support act performing an encore but I suppose it's not the done thing. We started to watch the Spock's beard set but as we had been late for the weekend shows and the trip back we skipped out after the second track. I've taken a good few pictures of both Kino and Spock's Beard . We flew two thousand miles just to take a look at you. Well actually it was more like three thousand but it was worth it. This was a slightly late Birthday present for me and an early one for Sue and I got my Birthday present of the 70-200mm lens too. We saw four shows by the guys two were short sets followed by signings and two were full shows. Not the usual place to see Marillion, they had clearly gone to great lengths to clear a space to fit them in and that is what it looked like. The staff were really helpful and even helped by shifting a couple of racks of CD's so that I could get my shots over the balcony. Mr and Mrs Vaxman came along too and yet again upstaged my camera having purchased an even bigger and better lens. Those of you who were there will probably realise I've got the above pictures out of sequence. They started with the show and then kicked everyone out so that we could form a queue for the signing session. When we had a nice chat with the band and had a couple of MOTR's signed for friends. The show was only about five songs but it was great to see the guys live again. During this tour they were often seen wearing 'One' shirts which is the US equivalent of Make Poverty History. If you have not already done so then please visit one of the links below. Supported by Jason Hart on keyboards in a really great venue. We took a friend along who had previously been a Marillion fan in the Fish era but had kind of lost touch with their later work. On the way to the concert she had said she hoped they played some of the old stuff like 'Sugar Mice' and we said that it would be mostly the newer stuff but if they did play anything old that 'Sugar Mice' was most likely. Well they didn't disappoint as you can see from the picture of H's set list. After the show we hung around for a while and the guys joined us in the bar. We managed to get to speak to each of them which impressed our friend greatly and I think we might have a convert. I was curious how they were traveling up to Boston and kind of hoped we might be sharing a plane with them. However I think it was Steve that told me they were going by train. At the end of the evening we saw the guys set off in a camper van which we found kind of funny when you compare it to some of the massive tour busses or limos that other artists might be seen climbing into. One thing that really impressed me was not having to watch the show through a fog of cigarette smoke. As with all such venues in New York this was completely non smoking and it makes a huge difference to be able to go home not smelling of smoke and it makes a difference to the pictures too. We arrived a little late and only managed to catch the last few minutes of Jason Hart who was supporting again. However I noticed that same camper van that I mentioned after the New York gig. Naturally I concluded that they had come up in the van and not the train. I was put straight by the owner of the van, Eric, who said he had tried to talk them into it and Pete was tempted but they had indeed taken the train. First impressions on entering the hall was that this was a really tiny venue as when you enter the stage is right in front of you with no more than 10 rows of chairs. Actually the venue was quite large because it is very wide and has a balcony that extends around the sides of the stage. There were a number of people in the audience that I recognised from the night before. Something I noticed was just how obliging everyone was often asking me if I'd like to take a shot from their place. We both really enjoyed this show and I think in part it was because you were close to the band no matter how far away you were and also because it really was a great show. This was quite a small gathering on the first floor of the store. They performed about five tracks and then there was a signing session. We had our MOTR PAL double DVD edition signed by the guys and had a good chat with them. Although I took a few pictures they really did not turn out well. I'll put a few of them up but I'm not really happy with the results. Oh the divided loyalties that are afflicting me now! I was not even sure if I should be placing this review on the Marillion page. 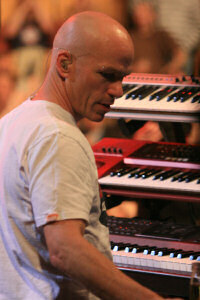 However he played a vast amount of Marillion material and he was part of Marillion for such a long time so here it is. That was a really great show, worth every cent. Well OK it was free but I really would have been prepapred to pay to get in. 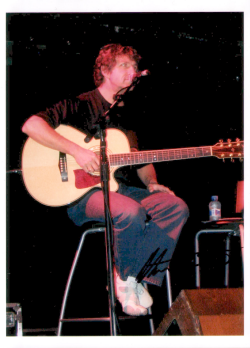 He started off playing two or three of his solo tracks including 'Big Wedge' and 'Credo' and then announcing the 20th anniversary of 'Misplaced Childhood' he played 'Pseudo Silk Kimono' and then later went on to play 'Kayleigh', 'Lavender', 'Heart of Lothian', 'Fugazi', 'Incommunicado', 'Market Square Heroes' and many more that we didn't remember to list but I'm sure someone will. I have to say in places I was missing Steve's guitar but otherwise it was really fantastic. The crowd seemed to really love everything he did although the Marillion stuff was clearly a favorite. I'll certainly be trying to get hold of tickets for the upcoming tour. I'm now really curious to see what Marillion do next week at Bospop. Although this is a two day festival we only went along for the Saturday along with some 10,000 other people. The acts for the day were V-male, Peter Frampton, Steve Lukather (of Toto), Uriah Heep, Marillion, Roger Hodgson (of Supertramp), and finally Joe Cocker. We arrived to see the end of Peter Frampton and managed to get a good place near the front. All the acts were really superb although we did leave early during Joe Cocker's set because it was getting late and we anticipated some large queues at the car park. A shame really because we could still hear him performing as we were driving off and it sounded like we missed a lot of his more familiar work. To our shame we didn't arrive early enough to see the whole of Peter's set but what we did see we enjoyed and it seemed that the rest of the crowd were enjoying hearing him play too. He played 'Show me the way' and 'Baby, I love your way'. 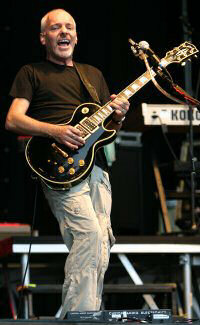 If you are now thinking 'Oh that Peter Frampton' then you are not alone, I had to refer to my walking encyclopedia. We managed to work our way through to quite near the front and stayed almost in the same place until the entire day was over. 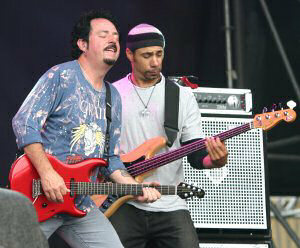 Equally Steve Lukather was a real hit (and I'll hear no comments such as did his bass player take time out from recording DIY SOS). He didn't play anything that we recognised although clearly the rest of the crowd knew his work and were singing along. It was very easy to get caught up in his strongly guitar based rock. Uriah Heep were on before Marillion. Naturally I'd heard of them but never heard anything by them despite their long career. I am now very tempted to go and check them out. I was extremely lucky to be in the right place to catch the pick that was thrown into the crowd. Normally I cannot catch to save my life and if I'm honest I just threw my hand out and was lucky that the pick hit me. Marillion were also on top form with H performing his gymnastics during the Easter encore by climbing up the rigging. This time he chose only to stop slightly before the lighting rig. The rest of the set was awesome and you could see that H was loving playing to the crowd. He made a passionate speach relating to the make poverty history campaign. Given that we were sharing the day with Live 8 this seemed very appropriate and well received. I must mention the guy who got me the Marbles pick. He had asked one of the security guards to get him one of the picks and he obliged. I offered to trade him the Uriah Heep pick but he said he preffered the Marbles one. Then he spotted that they swept another one off the stage and obligingly dived over the barrier and fetched it for me and was back before the security new what was going on. I am forever in your debt. BTW if there is anyone out there with any of the other Marbles picks that might like a trade along the lines of some of my pictures then please get in touch (well I have to try). 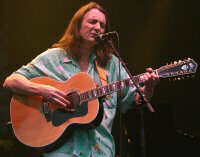 Roger Hodgson formerly of Supertramp gave a superb performance selecting a wide range of their well known work and it went down extremely well with the crowd. It brought back so many good memories for me and obviously for so very many people in the crowd. When you hear the crowd yell out for a particular song you don't expect it to be played. Well they shouted for School and he said they would have a go. Clearly it was lacking in some minor areas but it really did feel like they were doing it on request. Two guys on stage managed to reproduce the sounds of Supertramp so well it really amazed me. When he asked to see all the unbrellas in the crowd during the song it's raining again it made for a spectacular site, I only wish I had a picture of it. Again I think we will be looking out for Roger touring. Joe was the headline act and not scheduled to come on until 11:00 and when he did it was with around nine other musicians. Even so the vast stage seemed quite empty as most of the musicans were placed well at the back giving Joe plenty of room. Again the crowd seemed to be really taken by Joe and his growling voice. As a reference to the Live 8 he played a version of U2's 'One'. We left at around midnight and at that time he was playing 'You can leave your hat on'. As we pulled away in the car we could hear 'With a little help from my friends'. On the way in we happened to meet another Brit and he said he had been coming to the festival every year of the festivals 25 years. It really was a very well organised festival with everything taken care of (even the ground was covered to reduce the mud). Regardless of Marillion playing or not I think we are very likely to return to this festival next year. 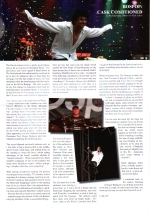 It's November 5th and the latest twisting tales has just arrived (Volume 5 Issue 3) and Sue phoned me to tell me they have used some of my pictures in the write up for Bospop shown here on the right. I don't need to say how delighted I am, this is exactly why I keep taking the pictures. For the headline picture with H surrounded by glitter I'd seen the glitter canons set up at the back but could not quite make out what they were. Luckily I was ready and able to get a few shots off when they were used. The Academy is on the other side of the road to the medical school where Sue did her PhD although it was not there when Sue was at Manchester. We had lined this show up as a suprise for a friend whose Birthday it was. If his reaction at the door was anything to go by then it appears he was completely unaware where he was going until we arrived at the venue. The show started with the two local lads Azis and Dal who will be familiar to regular Marillion fans. Sadly we were late and managed to come in halfway through their last track. Then Marillion took to the stage with H sporting a mortar board and whip for Accidental man. Hearing Fantastic place was wonderful but for me the high point was Neverland although Xmas Marbles was a bit of fun with a special guest apperance by Santa (actually it turned out to be H not the real Santa, sorry kids). I took loads of pictures and selected what I think are the highlights. Take a look at them by clicking on the following icon. Finding L'Usine proved tricky once the signs ran out. Apologies to the guys following us thinking we knew where we were going and got a free tour of the more obscure streets of the town. Once we had arrived the support act were performing their last song and I had to quickly get into the pit before Marillion took to the stage. The picture to the right is of H's set list. Neither Sue nor I remember hearing seasons end but we are both sure they played three songs during the encore. I'll have to have a look around because I'm sure someone will have noted the actual set list. I took my sister (Sally) along to hear them. She had gone under the illusion that Marillion were a sort of Heavy Metal band. She came away pleasantly surprised so I attempted to get hold of Marbles in the local record shop and found Marillion catalogued under Heavy Metal/Hard Rock. The fireworks during Mad were kind of expected after the same thing happened at Manchester but the shower of confetti was a total surprise. As this was the eve of Steve's Birthday a group of the audience lit sparklers and Steve was obviously delighted by this. I took a number of pictures and here is a filtered set of what we consider the best. A superb evening was made all the better by having friends over from the UK. Judith and Ian had especially flown in from Liverpool that day. Meirion came along too so there was quite a little group of us. As usual I left them all to enjoy the show from behind the barrier. They were supported by Gazpacho from Norway who are obviously keen supporters of Marillion and vice versa (I noticed Steve R had popped into the audience to appreciate a few tracks). Sorry there are so few pictures of them but the lighting was a little tricky, they are not actually a three piece band. Naturally the show was great with a real party atmosphere. We had fireworks, confetti, and a visit from Santa with all his little helpers including two from Gazpacho on fiddle and flute. After the show we popped into a local watering hole and found ourselves surrounded by like minded fans and ultimately several members of the band. The journey home seemed to take forever and we can't have arrived until around 4am. The Red Bull was doing it's job though but ultimately at around 5am I gave up uploading the pictures and went to bed. This might not have been too clever an idea as we have to see the band again tonight (Saturday) and we are off to see Porcupine Tree tomorrow. An added bonus was to find that when we arived home the Christmas CD was on the doormat. As usual I took the camera along and had fun recording the event. The following link will take you to the pictures . This was easily the best of the four shows we have been to on this tour, and very possibly the best show we have ever been to. At least partly this was the venue but also the band were in top form. I don't have the official set list but I do know that H basically tore it up and made up his own. 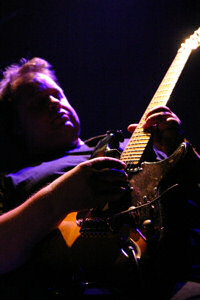 They were supported by Gazpacho again but this time with a brief but powerful guest appearance by Steve Rothery. Just thinking about it gives me that shiver down the spine that you get when you listen to truly great music. It's rare that we are taken by a support act but in this case we went off and bought their Firebird album immediately. Although there were no added extras in the form of confetti or smoke bombs the show really stood out as something special. Doors opened at 7:00, Gazpacho arrived on stage at around 8:00, Marillion at around 9:15 but it was not until just before midnight that the band returned to the stage for the final encore 'Erin Marbles' with H dressed as Santa and guest appearances from the fiddler and the flautist from Gazpacho and eventually the entire band. Between the start and end the audience seemed far more engaged than they were at 013, especially when H invited us to tell him what song he should play next. 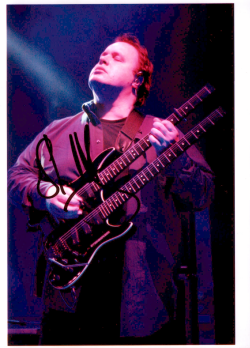 After the show we managed to buy a copy of the new Gazpacho album, Firebird, on which Steve Rothery makes a guest appearance, and managed to get it signed by most of the band. I would have loved to have had Steve sign the album too but Marillion were nowhere to be found (even Lucy was looking a little panicked at one point when she thought she had lost them :-)). Sadly that's it for us for this tour but what a great ending. The photos are here and have been whittled down to a more acceptable number. Thanks to the tour manager for arranging my photo pass at the last minute so I was able to take a few pictures. The guys were supported by a couple of Dutch guys from a band called 'For absent friends' (thanks to PH and Willem). This was an accoustic set so it was just the lead singer and the keyboard player. I was really impressed by the simplicity and clarity of their set. Kino were on top form and performed not only a large part of Picture but also some 'It Bites', 'The Urbane', and 'Marillion'. I have to say that there version of Sugar Mice was great and judging by the number of people singing along very popular with the audience. It's a great shame that the next Dutch gig is so far away otherwise I'd have seriously considered skipping the works Christmas dinner and going to that too. A selection of the pictures are available here. Very very quiet year on the Marillion front, they are working on the new album but we did manage to catch H in action and we flew off to Poland to see them in their only gig of the year. Still we have not stopped gigging, we just went off to gigs for other bands. What a great evening this was. At time of writing the tour is not over so I won't spoil it for anyone one else that has a show to go to except to say that Steve was completely alone on stage with only the keyboard and a lamp for company. It was a great mix of music and chat that captivated the audience to such an extent that even the locals where unusually quiet :-). The stage configuration along with the fact that the front row had small tables with candles and then around four rows of seats behind that made for a very intimate atmosphere. As usual I had the camera with me and you can see a selection of the pictures here. We'd never been to Poland before and as this was scheduled to be the only concert of the year we thought we just had to go. Even more reason to go was that the concert was scheduled for the same day as Sue's birthday. So Sue booked us a hotel and we set off. We arrived about mid day on the Friday giving us enough time to take a look around the town. After we had eaten we went off to find the venue and realised the extent of just how far away we were going to be. The stage was on one bank while the audience were about 150m away at the closest on the other bank. Even with a new 2x converter on the lens I was not getting really what you'd call a close up. The organisers had arranged a dress rehearsal for the performance of Carmina so we sat and listened to that. The picture here shows the view from the castle, it was taken while the stage was being dismantled the day after the show. You can make out the stage area on the left and on the right you can see the grassy area where the audience were gathered. The audience were also gathering on the bridge you can see in the distance. What you cannot see is roughly the same amount of space behind the camera and the terraces on the castle that were also being used and another bridge also packed with people. Estimates of around 100,000 people make this a huge audience for Marillion. On the morning of the concert I broke the news to Sue that she was going to be present at the press conference. After she got over the shock we set off for another look round town. We arrived at the boat to find a small crowd of the usual loyal fans who had obviously heard about the conference too. After the press conference started H was interviewed (I presume for television). We were told that later on a boat would be made available so that we could photograph the stage from a position a little closer. We went off and had some lunch and then came back for the afternoon sound check. We arrived a little late and it was fabulous to hear Marillion and in particular at that stage H booming across the parts of the city closest to the river. We didn't stay for the entire sound check but instead headed back to the hotel (we had heard that the band were staying in the same hotel as us, this is the second time to our knowledge that Sue has managed to do this). We headed out later to get to the show in time to get on the boat. While we were out on the boat photographing the support act (Lech Janerka) I noticed that the images were coming out mostly black. In a panic I tried to find the problem and it turned out to be rather permenent. A temporary fix left the camera unable to automatically focus so all the remaining shots were taken while trying to manually focus and I'm afraid the results are rather poor. Anyway the camera is now off with Canon being repaired. So then Marillion hit the stage and the boat went out again. The first trip was for those with video so we had to wait our turn. They were out for the full three songs they had been promissed and then returned to swap over to some of us with still cameras. Trouble was there were rather more of us and as the boat swung into position everyone rushed to the same side of the boat causing it to lean over at an alarming angle. The captain rushed out of his cabin to say something in Polish which I can only assume was along the lines of 'move away from the side if you don't want to drown', it had some effect but the problem is that it's such an intense moment when you are trying to photograph that little else matters. Anyway our trip out was cut very short and back we went while Beautiful was being played. Frankly the near death experience combined with a defective camera and trying to frame pictures on a boat that was swaying backwards and forwards made me decide to stay on the river bank for the rest of the show. I'm sure I could have gone out on the later boats but I'm not convinced the pictures would have improved much. I've heard various reports about how the audience reacted to Marillion from indifierence to wild excitement. Certainly I would not say the reception was your usual Marillion audience but personally I thought they were very well received by the people I was nearest to. What stuck in my mind was the way the Polish pronounced the bands name, they broke it into three parts with more emphasis on the -ion so that it came out as ma ril yon and this was being chanted by the crowd eager to have the band return for an encore which they received. After Marillion we were treated to a performance of Carmina which included monks in red cloaks carrying fire brands, jet skis, dancers, women being hauled out of the river on giant pianos, and to cap it all off a firework display. It was a very impressive show all round. After it was all over we made our way to a pub in town with a bunch of other fans. We spent another day in Krakow and flew back on the Monday morning. It really was a great holiday and made all the more perfect by celebrating Sue's birthday with a Marillion show even if it was a little short. Anyway I've finally managed to get some of the pictures sorted out. Again sorry they are not all that good. One final comment, you will notice two accordion players amongst the pictures I took. They really impressed us because we first heard them as we were walking towards a church and I was initially convinced that they were playing something on the church organ because the sound was so big, and then we noticed these two guys with their accordions. I'm not normally taken to giving money to buskers but these guys deserved a donation. This is going to be a good year for all us Marillion fans, new album and tours to support it and a convention. I've devoted another part of the site to the convention because there was so much going on. 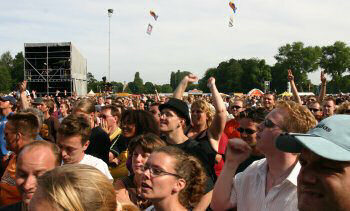 For those who were hiding under a rock during February, the convention was held in the Centre Parks in Zeeland, Holland. Generally heralded as a success and a damn good time by everyone that went it was three nights of Marillion and a chance to hear some of the new tracks from the new album Somewhere Else. Click here to go to the part of the site dedicated to the convention. Well we had waited an awful long time for this. I know it's only been a few months since the convention but it feels like forever. It was superb to bump into loads of people that we knew, so many people to mention but I'll stick to mentioning Kate the ultra fan from Poland who was at the front of the queue. A Day's Work were supporting and I'd really managed to get into their music during and after the convention. I'd seen them on a couple of occasions since the convention and on the last one I'd spoken briefly to the lighting operator. He wrote to me after the gig and wanted to use my pictures for his portfolio. Well I thought we could perhaps do better so I've been trying to get some interesting shots of the guys in action for him. But what about A Day's Work? Well I enjoyed their set although due to a slight issue with the photopass I missed a lot. It seems that someone, perhaps the promoters, had said photography only during the first three songs. Now this is quite normal at many gigs but unheard of at a Marillion gig. Anyway we managed to get the promoter and the stage manager to talk and he allowed us to shoot the entire Marillion set, phew. If you are interested in the pictures of A Day's Work then you can see them here . 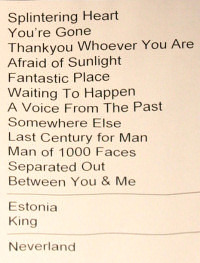 Marillion were on great form, you can see the set list contains some real classics. The picture of H with the megaphone was taken during Somewhere Else. I'm not sure when the picture of Pete was taken but doesn't he look smart! Well we had a great chat with various people after the show including the guys from A Day's Work. Then we realised we both had to work and had a 1.5 hour drive ahead of us to get home. Well I took loads more pictures than I intended and you can see some of my favorites here . Again it's been a while since we've been in the Vredenburg and it was Marillion then. I'm so taken by this venue. It is more or less in the round and there are seats on all sides going up about 4 stories. The view from the very top is awesome and a little scary. It's a great shame that there is talk of demolishing it and rebuilding it. Again A Day's Work were supporting and this time I was able to stay for the entire set. I think they went down really well, when we left they were still busy signing CD's for quite a crowd. I think there are a few people who are going to find just how good the album is. You can see a gallery of their pictures here . I met up with a few people who had been along to the Almelo and Hardenberg shows. Almelo was an open air free show in the town centre and apparently traffic problems had caused the guys to turn up late but it sounds like it went down well and I have to say I'm a little envious of those that went. 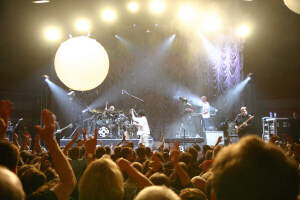 Then the evening show was in a much more intimate venue, I'd really like to see Marillion playing such a venue. I was told that they had played Faith, for me that's one of my favorites of the new album and since it was released during the Marbles tour. 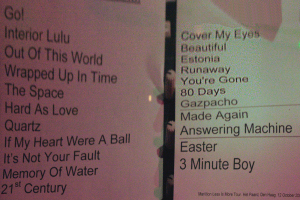 You can see from the set list that it was broadly speaking the same as 013. But they did play Faith and that made me very happy indeed. H told us that he was not feeling on top form due to having been operated on that day. Perhaps the last minute change to the set should have been to sing The Wound instead of Easter. Still we enjoyed Easter, as far as Marillion were concerned it was an instrumental, vocals were solely provided by the crowd. I'm sure H intended to sing but the crowd were going so strong. Anyway get well soon H.
At Tilburg we had confetti and balloons but at Vredenburg they don't like using confetti, something to do with it being a wooden floor apparently. But as this is the same wooden floor they plan to put in a skip at the end of the year I can't see the problem myself. Still the Balloons were a bit of fun and once again Mark made an effort to kick as many of them as possible into oblivion with what must have been the pointiest shoes on the planet. Luckily this time he had his work cut out for him because very few of them went his way. 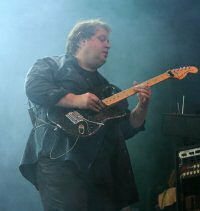 You can see the gallery of Marillion pictures here . It's not long until the next show for us and that will be in the same venue but supported by a different band. A couple of colleagues joined us for the show and I think they both had a good time. 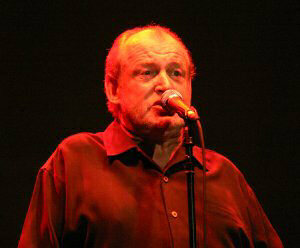 Our usual Marillion companion, Meirion, was not feeling to good so stayed at home. All the best for a speedy recovery mate. 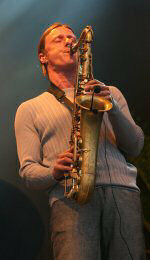 Marillion were supported by Monstertux who are a Dutch band. The style was quite varied, initially I'd thought they were going to be quite a chilled band but then some of their tracks were actually quite rocky and upbeat. You can see some of their pictures here , it was lit a little bit darkly but still some worthwhile shots. Just take a look at that setlist. I am so pleased that Marillion chose to make so many changes, not because I did not enjoy the last show in any way but rather because it's always nice to go to a different show. They played 'Ocean Cloud' can you imagine how that went down with a packed Vredenburg. I know people will disagree but I just loved 'Fantastic Place' and 'Between you and me' and 'The Space'. I had been wanting to suggest to Marillion that they close the gigs with Hocus Pocus but did not feel certain that anyone else would agree. I cannot claim any responsibility for them playing it this evening but I found out that I was certainly not the only person who was delighted to hear the song performed again, naturally accompanied by the giant balloons. The announcement at the end of the show that they would be back in December was exceptionally well received. Well I'm not going to wish away half a year but I'm really looking forward to that. We ended up in a local bar after the show along with a load of people. For some it was the last show and for others they already have their tickets booked for other shows in other countries. I want to make a brief comment here. While I've been going round taking the pictures at all the shows not just this one, I've encountered so many people who have been kind to me and offering up their places for a moment so that I can get to take a shot or just helpfully stood aside as I came past. I have to say a really big thanks to all these people. But I'm aware that getting in the way can be annoying to some people so I'm sorry to anyone that was annoyed at me getting in the way or stepping on your toes. 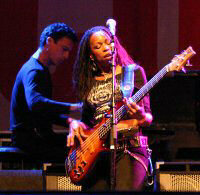 However an incident that occured during this gig worried me. You can see how steep the steps are along the side, I was photographing on those steps and I believe that I was in nobodies way having crouched down so that I was as low as possible. Suddenly I found another photographer hurled at me from behind. It seems that someone behind him took exception and pushed him down the steps. So I am aware that not everyone is happy with the presence of photographers. Let me start by saying I'm really angry. Not perhaps the normal way to start a review but this is my soap box and I'll damn well stand on it and use it if I like. The day after the concert four of us decided that the once in a life time trip to Auschwitz. 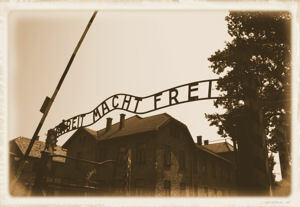 The evils that mankind can invent to inflict on their fellow man are truly awful and this place is, and should remain, a permanent reminder of this. But what really angers me, I mean really wanting to stand and shout type anger is that despite this all being only some seventy years ago we, the human species, appear to have learned nothing from the tragedy of this place. Did so many people really have to die and yet we still turn a blind eye to attrocities that are being carried out? Are will still so sheep like that we can be convinced of the benefits of the savagery of war? Is it really, honestly, more important that we earn a little bit more money while people all over the planet are starving to death? I intend to write more about my visit, perhaps in another part of the site but for now I'll climb off my soap box and stop. 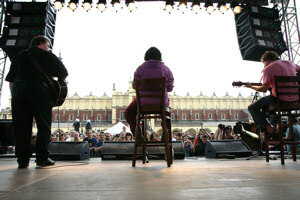 We flew in to Krakow on the morning of the gig and made our way to the hotel and then on into the town square. If you have never been to Poland then Krakow is a really great city to start with. We had only been once before and that, too, was for a Marillion concert. We started off in a little bar that we had found on the last visit. It's called oldsmobil, yep that's how you spell it, it's themed based on the cars but not overtly, just a few pictures on the wall. Incredibly friendly staff and not that expensive. Very memorable was the beer, Dog in the fog, it's sweet and strong, a meal in it's own right really. We were to be treated not to just the one gig but to a free gig by Los Trios in the town square and a signing session and then the gig in the evening. I managed to get close enough to get some reasonable shots of the open air free gig. It was quite short, about 30 minutes, and the weather really only held off from rain for the duration of the gig. We did have one awesome sound effect, a huge crack of thunder, and I do mean a crack not the usual boom or rumble but more like the sound of someone using a very large whip. 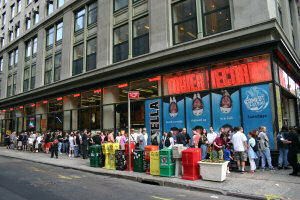 The signing session was held in the deparment store behind the outdoor stage on the second floor, the queue started outside and then through the ground floor and then wound up the stairs. As an omen of things to come it was incredibly hot on the second floor so I took a few pictures and got out of the way. While there I did notice a plentiful supply of this book. 'Excellent' I thought before realising it was the Polish version. I really cannot see that everyone in the queue managed to reach the signing session because the queue was still huge when I left and that would only have been a couple of hours before the start of the gig. If you are interested in more pictures of the free gig and the signing session then take a look here . So then we headed off towards the gig, lovely evening for a walk, there had been some rain during the signing session so the air had cleared. It was quite a walk to the venue but we made it stopping to pick up a couple of apples and tins of red bull for dinner and some water. The walk took us past the cities two football stadiums which pleased Ian no end being such a huge fan of the sport (I've seen their spare room, he is more addicted to footie than the average Marillion fan is to Marillion). As we approached the venue, but before we realised how close we were, we asked some guys with Marillion shirts where it was. They turned out to be Polish and I thought they said 'It's that black hole over there', I think he said 'hall' but actually 'hole' was not innapropriate. Don't get me wrong the interior of the venue was fine but hot, I mean incredibly hot, sure they had ventillation, you could see the fans around the edge of the walls that let daylight in but they were not really having much of an effect and with the venue as full as you could ever want it to be the heat problem did not get better during the evening. To make matters worse I was told that people asking to be allowed to go out for fresh air were told they would not be readmitted. I met someone the next day who told me that he had been to another of the Polish gigs and someone there had a mobile with a thermometer that registered 48C. The photo pit was a bit of an obstacle course, it had been filled with the cases of the bands equipment and the audience barrier had struts that came down into the pit so it really was difficult to get around. For this reason it was OK to have to leave after three songs. Normally if there are restrictions they are told to you as you collect your pass, I'd been told of no restrictions so I carried on shooting after leaving the pit and certainly I was not the only one. Then at the end I went upstairs to try and get a clear shot of Ian and someone with a laminate told me three songs only, so if you are an Ian fan sorry. Anyone at the gig will be able to tell you that there is something wrong with the set list I'm showing here. It does not contain Most Toys! The audience started calling for it to be played and H turned to Mark who gave him the nod and off we went into a complete version of Most Toys. I cannot remember where it came in the running order but I thought it was before Afraid of Sunlight but I've read elsewhere that it was before Somewhere Else. After most toys the audience started calling for Angelina but H was having non of and using less polite words asked them to be quiet and listen. Well it was great to be at another Marillion gig and obviously really nice to be back in Poland. 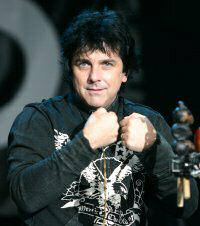 The pictures of the gig are in the gallery here along with a few pictures from around Krakow. This is the first UK gig that we have been able to get to but with two more to follow plus two possible in store shows I think I'm going to be kept quite busy. As a lot of you probably know I tend to plug my Brother in law's guitar shop, Jam Guitars, as this is based in Bristol it seems like as good a time to give them another plug. Well after a very good first year they are having a Birthday party on the 14th, there will be live music and celebratory discounts. 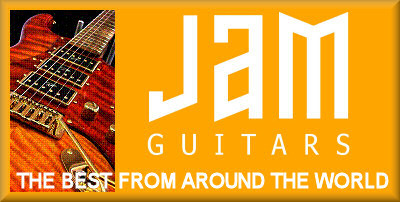 If you want to know more then pop along to their web site (www.jamguitars.co.uk) and read all about the celebrations, all are welcome. Pete my brother in law (and co-owner of Jam Guitars) and his wife joined us for the evening. My earliest memories of Pete are of him practicing guitar in his bedroom and even then he was playing covers of Floyd, Genesis, and Marillion so we knew he was going to enjoy the evening but we may have a convert in his wife. We looked up the Colston hall on the web and found it was supposed to be all seater split across stall and a large balcony and I was not looking forward to the idea of an all seater concert. I need not have worried as the front seats had been removed so that half of the stalls were standing room. Actually the hall layout was excellent, you could see the stage from pretty well everywhere but my only complaint was that it was again a little too warm. Marillion were supported by The Reasoning (excellent web site) who are a Welsh band with a very lead singer who shares my taste in footwear. She is the proud owner of four pairs of New Rock boots. She gave a distinct goth image but the music was really more regular rock than some of the goth rock bands I've been listening to. While we were trying to decide musically what they were like Rush were mentioned and for other songs they were far more folky. For their last song they were joined by Steve R. Anyway I've published a gallery of pictures I took of them, I withheld the picture of her boots but you can see the rest of the pictures here . At the start of the show someone told me that they could see something a little strange in front of H involving wires and bits of cardboard and batteries. Well I took this picture of the arrangement and it looks like a group of guitar pedals with the captions 'Super Loud Pedal', 'Danger Flanger', and 'Auto Speed Solo'. I'm not sure of the story behind these but I'm under the impression that H was a little left out because he does not normally have pedals of his own. This was the official set list but actually they did not play the Invisible Man. The first encore was Estonia and then the second was Neverland but otherwise the setlist is accurate. Beautiful was dedicated to er well actually they forgot and in the end dedicated the song to anyone in the audience who happened to have their hand up, so that was almost everyone. We had balloons during Between You and Me and once again Kelly the balloon killer was on the prowl bursting at least four or five of the balloons. You can see the gallery of pictures by clicking here . Before the gig there was a short free set by Los Trios in the local HMV followed by a signing session where you could get your copy of the new single signed by the entire band. Judging by the layout of the store they had anticipated a much smaller crowd than the 300 or so that actually turned up. The set consisted of only a handful of songs and I seem to remember that they played 80 Days and the The Answering Machine but perhaps someone will get in touch and let me know what the rest of the set consisted of. I do remember that H told us the pirate joke (again). There are a handful of pictures from the set and the signing here . After a Guiness and a quick bite to eat in the slug and lettuce we walked back up to the venue Rock City. The best way to describe the venue is cramped. Really they were having difficulty fitting all of the Marillion equipment into the venue and apparently a lot of the lighting rig remained in the van. They were supported by a sheffield based band called Nine More Lies whose style is again difficult to pin down but they seem to have a long list of excellent reviews to their name and I'd say the lead vocals remind me a little of Jan from Gazpacho but the rest of the music is quite different. You can see a gallery of the pictures here . Clearly someone in the crew with a childhood involving Blue Peter had a bit of time on their hands because in addition to Steve's cardboard pedals (see Bristol) there were now two extra cardboard speaker stacks (labelled from top to bottom H System Tinnitus Enhancer, P45 Mid Range, and B52 Mega Bass Box) and H had his own cardboard monitor fashioned out of a box and a paper plate. I don't have a picture of it but there was also a tumble drier next to the stage. I was told by the security guards that Marillion had been drying clothes all day with it. Well I suppose it is a kind of wondering band of minstrels and even they require clean clothes sometimes. On one side of the stage there was a DJ's box which gave the view of most of the stage and the audience. You can see there was a decent sized crowd at the venue (certainly more than the 300 who had been to HMV). The set started by following the set list but then after Afraid of Sunlight someone shouted for Most Toys and again the guys decided why not. After that it appeared H started playing the wrong song so after 10 seconds he stopped and made a joke about playing 10 seconds of all the Marillion back catalogue and went on to Uninvited Guest. The audience were not in a mood to accept just 10 seconds and together we sang the whole song. After that someone shouted for Fantastic Place and H was heard to mutter something along the lines of 'Thank God for that' and the set list resumed. I had been asked if there were going to be any suprises and I'd read the set list so I knew about The Wound. As far as I can tell this has not been played all that often so it was a bit of a treat. Marbles 3 followed by The Damage also seemed to get a great reception. However we did lose Neverland off the end probably to compensate for the time limit imposed by the venue because of the two extras. The gallery of photos is here . Again there was a free show in HMV to promote the new single followed by a signing session. They played See It Like A Baby, 80 Days, and The Answering Machine (at least that's how I remember it but I prepared to be told I'm wrong). While tuning up for the Answering machine H decided to ask the audience what they did if they lived locally. One guy was a biker??? No on second asking it was a baker which made more sense. Then one of the guys in the front row declared his job was clearing the railway lines after people commit suicide by jumping in front of trains. 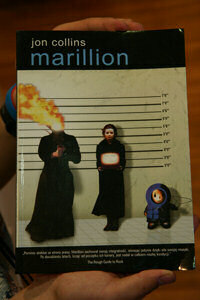 You see, not all Marillion fans are software engineers (OK there was one of those too). Having skipped the signing the day before in Nottingham we decided to give it a go this time and got one of our copies of the single signed and the programme we had bought at Bristol (take a look in the photo credits if you own one and you should see a familiar name :-) ). Anyway here is a gallery of the photos from the store . We returned to the venue (The Junction) to meet up with a group of friends who were most of those we had gone to the convention 2007 with. For one, Joss, it was a Birthday present a day late. There was a fair sized queue outside the venue of people waiting to get. At the front was this sign which brought a smile to my face. Another one that I missed but was told about later said 'loud music may be played on these premises!'. The support act were King Rat, a rock band from London. They made a somehow dramatic entrace to the very packed stage. In fact the stage was so small that they had to extend the stage out into the photo pit with various bits of equipment and flight cases making getting around a little difficult. They certainly went down very well and according to their site managed to sell 70 cd's probably because we were frequently reminded that they were on sale but also because they really were very good. We bought a copy and asked the lead singer to sign it for us. We've been listening to the CD since and it really is very good. Anyway here is the gallery of pictures of them . Luckily for me they cleared out the pit as they clearead the stage so photographing Marillion was not as tricky as it might have been. Once again the stage was littered with carboard cutout equipment, but you've seen all that already. This was the first time I'd spotted a fridge on stage. This was located next to Mark's keyboards. Reading down the set list we were going to be treated to the usual start but then Ocean Cloud!!! You can imagine how that went down with the packed audience. The Wound was also played again so that's two nights in a row and was again well received. I personally love Easter and I knew what was to follow. How could they not play Garden Party in Cambridge?! Well even though H clearly fumbled some of the lyrics and helped by him performing a certain amount of the song from the top of the speakers, it went down a storm. If you want to see the gallery of the show photos then click here . Marillion were running to a really tight schedule so the doors opened at 6:30 and the support act, Public Symphony, were on stage not longer after that. Most people I spoke to about Public Symphony had nothing but nice things to say about them although as usual there were some who did not enjoy them. Their own web site lists a number of positive reviews including one by The Works that declares them to be 'A Pink Floyd for the Coldplay generation'. Being a Floyd fan (lapsed) myself, I can't quite see the link but still I did enjoy the music and they certainly filled the stage. Here is the gallery of pictures of them . During the quiet bit between the support and Marillion I had a chance to go walk about and see what kind of people were in the audience. One group that stood out were this lot with their inflatables. These were probably seen by most people (the inflatables not the people) as they spent a large part of the show being hurled around over the crowd. There was also a dafodil that was doing the rounds, I suspect that was from the Welsh Marillion fans. Anyway if you were wondering who the inflatable belonged to now you know.. So Marillion followed the support fairly swiftly and headed straight into a somwhat familiar set to anyone who has done more than a few shows. Splintering Heart was the usual starter but this time we had a bit of pyro technics. Sue was down the front when these were set off and clearly remembers feeling the heat blast from these. 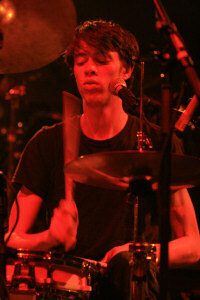 It was great to hear The Wound again and naturally Ocean Cloud hit the spot for nearly everyone in the packed Forum. But tell me, where on the set list do you see Sugar Mice? You don't do you and yet they played it! I'm getting the impression that sticking to the plan is not an option for Marillion. And just as well really because Sugar Mice is one of those songs that seems to stir the spirits of most Marillion fans (certainly those as old as I am) and is a 'you know who' era song that H really brings something too. I've no idea what happened during King but H's guitar packed up and so the rest of the band had to stand in for him. Initially it was Mark improvising on the keyboards and then as the song neared the end and H was supposed to be doing the usual ending, after a few nervous glances towards the guitar tech, Steve R took over assisted by H who insisted on doing the right hand while Steve carried on doing the left. Anyway it goes to show just how versatile they are. It was Ian's Birthday so I guess he didn't get the night off to celebrate. I think it was universally known whose Birthday was being celebrated and at one point, even before H could announce the Birthday, the audience broke into a round of Happy Birthday to You. Amongst other extras were confetti filled balloons during Between You And Me and confetti during Neverland and another round of fireworks but I can't remember when that came (perhaps someone could drop me a note to remind me as it's been my experience that you lot take careful note of every detail). H once again mentioned a December tour so I guess it's really going to happen. The somewhere else tour is virtually over for them and us. Because the show was being filmed pit access was restricted to during the support act but luckily there are a couple of great places to shoot from on the stairs at the side and at the front of the balcony. I managed to sneak a couple of shots from the end of the pit where I was in no danger of tripping up a camera man. And I owe a huge thank you to the lighting guy who, during A Voice From The Past, allowed me to use his podium to shoot from. As you can see the film crew had some shirts made up especially for the event. If you can't quite make it out the writing on the back says 'We're here to film somewhere else'. The event finished early and we were ushered out of the hall with some urgency. The next lot were already starting to form a queue outside. The line seemed to be almost entirely comprised of girls dressed as school girls so I'd guess that was the theme. After the show a few of us went to a bar for a few drinks before being forced to make an early retreat (now in the pouring rain as the muggy air had finally given way to something more refreshing if a little damp) to the underground before that closed at the stupidly early time of 12:18 and we would have been forced to take a taxi. Sue grew up in London and so we spent a short time the next morning looking at the sights. We walked up from the houses of parliament towards Trafalgar square. On our way we stopped for breakfast at a small Italian run place. We had to laugh, the food on display looked great and indeed it was actually quite nice but my 'strong coffee' was only vaguely aquainted with the bean. The service was positively hostile (but quick) and we even saw other customers look around in amazement as serving staff were actively forcing people into making decisions long before they could have had time to peruse the menu. I'd have loved to have opted out of leaving a tip but service was, apparently, included. I'd forgotten that such places existed, it's so much the opposite of what we are used to in Holland. 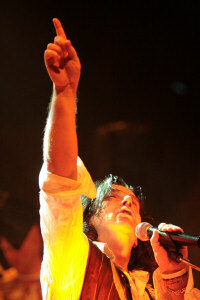 OK we've done the Marillion gallery for Saturday and all the other galleries will follow. For now you can see the Marillion one here . We decided to make a long weekend of it and flew to Oslo on the Friday, it was already raining! To be fair it was raining back home before we left Amsterdam so it was not just an Oslo thing. 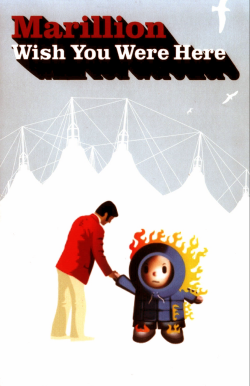 Still I'm beginning to be convinced that Marillion might to well with a range of rain wear on the merch stand. I can picture it now and umbrella with the words 'right now I wish I were Somewhere Else'. Oh OK I'll give up on marketing ideas and stick to the photos. We were really impressed by Norway right from the first moments in the airport. It was one of those places where the architect had clearly put some thought into rather than just some concrete shed. Then we found the train to town and that ran every ten minutes (even though we'd arrived late) so we were soon in central Oslo and soon after that at the hotel. Next morning we wondered round Oslo taking in some of the sights of the city and found the venue. It was still raining and everyone we spoke to assumed we'd brought it from England and let us know that they had had weeks of sun before we arrived. Fed up of trying to squeeze under one tiny umbrella we found a shop and bought another one only to find we were being served by a Dutch guy that had moved out to Oslo 6 months previously to be with his girlfriend. Small world eh! We had heard that there was going to be something going on before the gig and found posters for the tribute act Misplaced Neighbourhood to be held in another part of the same venue called the John Dee bar. We found out later that Rich, lead singer of Lords of the Backstage, was singing for these guys too. The pre-show show started at around 8:00 and lasted only for around four songs but they told us they would give us a longer show after the Marillion show. You can see some of the pictures of Misplaced Neighbourhood in the gallery here . Doors for Marillion opened at 9:00, the venue was not massive but it was split across three levels. 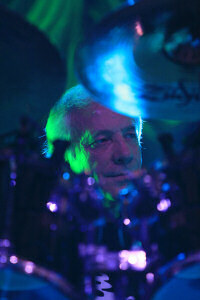 During the Marillion tour I'd seen Robert as Ian's drum tech and kept thinking that I knew him from somewhere. 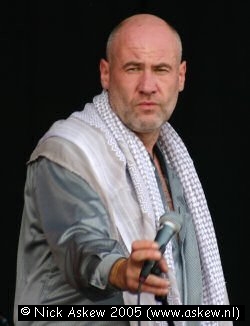 As soon as Gazpacho hit the stage at around 9:30 with a great set of material from Night I immediately realised who he was D'oh. I'm really incredibly impressed with that album and hearing it live was fabulous. You can see the gallery of Gazpacho pictures here . Marillion themselves hit the stage at around 11:00 and went on until around 1:00 and then it was back to the other venue for the rest of the Misplaced Neighbourhood show and that went on until 3:00. The Marillion gallery is here . While I was at that show I had a chance to talk to one of the photographers who I'd seen at the Marillion show. He showed me some of the previous pictures he had taken including some from the mid sixties. I was more than a little impressed to be in the company of a guy that has been doing concert photography since I was one year old. After the gig we went off to another bar where some of the guys from Gazpacho were hanging out and stayed there for a little longer. Perhaps due to it being mid summer the streets were alive with people and being that far North it had already been light for quite a while. We stopped to listen to a busker for a while and eventually got to the hotel at 4:00am. Sunday the sun finally put in an appearance but only for part of the day. We spent the day looking round Oslo again and took in a ferry ride to the museum of the viking ships and the kon tiki museum which is a tribute to the amazing adventures of Thor Heyerdahl which will probably be familiar to anyone who was around in the 70's and building balsa wood rafts was all the rage. Finally on Monday we flew back home. Great festival with Status Quo, Marillion, Willy de Ville, Steve Harley & Cockney Rebel, and more. Fabulous weather given the summer we were having. You can read more and see loads of pictures on the dedicated part of the site here. It was great to be back in my second home, it's been a while since I've covered a show here and it's almost always a real pleasure. This time was no different, a decent sized crowd that was certainly much bigger than the last H show (this time the balcony was open) and it really had a feel of a family gathering. H had upgraded the stage a little since the last show playing a larger piano with a few more table lamps and far more imaginative lighting. I really cannot remember the set list but it did seem he was sticking far more to Marillion and H Band material. He was telling us about 'patter', the script which some artists follow that becomes obvious when you attend a second gig. While I'm sure that H repeats the stories he reads from the laptop he really did seem to be making it up the rest on the spot. He was telling us about being inspired by Deep Purple (pictures from Arrow 2006 here) and The Who. He also told us of his impressions of the Heineken Music Hall gig and their support act Porcupine Tree ("a mini Pink Floyd") when they played there so many years ago. I could have sworn that last time he played guitar in addition to piano but checking the pictures from the February 2006 show it seems either I did not photograph him with a guitar or more likely Sue and Meirion were right and he only played keyboards. Well I've published the usual gallery of pictures here . Well it's been a while since we've seen the guys in action so we were delighted to find that they had chosen to start the tour in our local venue. The Boerderij is not a big venue, it has a capacity of around 750 when the balcony is open so it was a bit of an unusual choice. We arrived about twenty minutes before the doors to find the longest queue outside that I've seen for a gig at this venue. The tour bus and huge equipment truck parked outside the venue made us curious just how much equipment had been taken inside. Inside we found more lights than I think I've seen on any stage before with the possible exception of stadium venues. There was no support act so it was straight into the Marillion set at around 9:00pm. The gig was divided into two halves, the first half was 'art' while the second half was the up beat rocky set. The gig went very well other than a brief technical problem with the lighting leaving the band in the dark during most toys, and H getting a little forgetful during This Strange Engine. They played us a new track, Real Tears For Sale, and for me it was an instant hit. Normally new Marillion work takes a couple of listens for me but not this, I really hope the rest of the album is the same quality. The show ended with Pete and Mark handing out Kazoos and H dressed as Santa. They tried to teach the audience a bit of a song but instead the Dutch crowd gave a rendition of a traditional Dutch Sinte Klaas song. Then we had a rendition of Let It Snow with something of a suprise finish which I won't reveal right now. If you are curious what the finish was you can find out in the pictures on the gallery here . I also thought I'd get a few shots of the guys that help out behind the scenes. So if you are interested in seeing those people who help make it all happen then take a look here . Some of you might also be interested in seeing the recent pictures of Porcupine Tree (in Amsterdam's Heineken Music Hall) and IQ (in the Boerderij a week earlier). If so then click here to go to the general music page. Two days of Marillion in the Paradiso. For those of you not familiar with one of Amsterdam's most famous venues, this is a converted church or chapel. They even have the stained glass in place but I suspect it might be a replacement in some areas, the most impressive windows are those behind the stage but on this occasion they were hidden behind the Marillion backdrop so the background to this report shows some of the smaller windows from the venue. I am very grateful to have been given access to the venue a little early which gave me a chance to take a few snaps of the inside of the venue and some of the kit, you can see some of these here and there are others in the galleries. Once the doors opened the sell out crowd quickly gathered and what had seemed like a relatively small hall when empty suddenly started to feel very big. Certainly getting around the place was more tricky than I'd been used to. This was one of those evenings when the Paradiso was filled on all three levels. You really do get some amazing views from the top floor but it's perhaps not a place for those with any kind of fear of heights. The Tuesday night show began, just as it had at the Boerderij a few days earlier with no support act so it was straight into the guys playing The Bridge. In fact the entire set list for Tuesday was exactly the same as it had been in the Boerderij so take a look above if you are curious. Hearing Real Tears For Sale again has not changed my opinion, this is an excellent song and I only hope that the time for us to get our hands on it is not too far away although at the same time I hope they don't feel they need to rush the rest of the album. All too quickly the gig was over and we retired to a local bar for a quick chat about the gig with a friend who had been to his first ever Marillion gig and another who was going to the next night, his first Marillion gig in many years. The gallery for tonights pictures is here . Some of you might also be interested in seeing pictures of the Fish gig that took place in the Boerderij the night before. If so then pop along to this page. So Wednesday night and for Holland the last night of the Christmas tour. Some of you might have expected the same set as the previous night. Well that would have been boring, two nights the same venue and same set!! Still we know someone who, thinking he knew what was coming next, popped out during Cannibal Surf Babe and was asking at the merch desk 'Where's Jim?'. The response of 'Oh he's inside listening to Ocean Cloud' caused something of a panic and a hasty return to the hall. I have to say it really was excellent seeing and hearing Ocean Cloud, Neverland, and the Invisible Man in one show. The show finished with not one but two Santa's, I'm inclined to believe at least one of them must have been an imposter. My money is on the drunk, inflatable santa operating the keyboards. Well let's hope that 2008 brings us all something really special. For us Marillion fan's it will be an album year so that's the great news. The friend who was at his first Marillion gig for a very long time was unstoppable. We may have another regular on our hands. Conversely the former colleague I coincidentally bumped into in the street after the show simply made the usual noises of someone from outside the 'family' ("Oh are they still alive" and "Fish!!") Grrr! Well tonights pictures are here . I really cannot believe that 2008 has gone past so quickly nor that nearly a year has gone past since our last Marillion gig. The first half of the year had some gigs but the second half has been very quiet. The main reason for this is the huge change in our lives. In May this year we adopted a little girl from the south of China. She is now four years old and the bonding process is building nicely and hopefully our parenting skills are getting better. Those of you going to the convention will get the chance to meet her. So after a huge wait I've been allowed to go off and photograph another Marillion gig. Actually four Marillion gigs in a row but this is the first. I'd never been to this venue before and according to google maps it has no roof (possibly because it was half built when they took the photo). It certainly did not exist in my navigation system and the only sign I saw directing anyone to the place seemed to amount to an A4 bit of paper some crayon and sellotape. The weather was giving us a taste of what to expect over the coming days. It was freezing! Due to the cold weather everyone was allowed inside the building not not the actual hall and were made to mill around the merchandising and bar for a while (very clever). Eventually the crowd started to build. I had feared that with it not being a sell out it would mean that it would feel a bit empty. Well I'm not sure how far short of full it was but it certainly did not feel empty. The gig started with the excellent Sine Star Project set. These guys are from Southampton but I'll resist trying to describe their style other than to say I find their 'Eternal Sadness for Man' superbly mournful but a lot of other numbers were really very upbeat and even heavy. I am not sure quite what goes on (if anything) behind the scenes but somehow every Marillion support act has to go through the same ritual of playing in a near total blackout with very little front lighting giving everyone that panda appearance. You can see the gallery here . Marillion gave, for me, a great performance but I could not help but notice that the set list was only for guidance tonight as they certainly never played 'Happiness is the road'. But for the rest it was fabulous to finally hear Marillion playing again and really great to see what they had chosen to play from the new album. I am particularly attached to the song 'This train is my life' as I seem to end up hearing it practically every day while on the long train ride to work. I stuck around after the show to take a look at the results of my photography and to pass them over to one interested party. I then left when the car park was nearly empty and made my way home through signs of snow that had fallen during the gig. The gallery is here . Now I want to mention that I've heard a number of people make complaints about the gig. Some people have said that the audience did not seem to engage with the band or vice versa and others have said some members of the band seemed bored. Well I did see a few people right at the back who seemed more interested in chatting with each other but I genuinely did not pick up on any bad vibe. If you take a look back at the first gig you will see that this was the first venue that I saw Marillion in since my 'rebirth' into the Marillion family. Naturally enough I assumed it would be in the same hall as last time so I was a little startled to find that actually there was a bunch of loved up brides attending a wedding exhibition in that hall. The actual hall was a bit more impressive than I remember the last one being and the stage was huge. We had decided this time to stay over in Zwolle so we booked a hotel and checked in early enough to go for a walk around the town. We had never been to Zwolle before and our walk did not really give us time to see it all but it did seem to have a really nice old town. After a coffee in a town centre cafe to warm us up we headed off to the venue. Sue and Yizi are not able to go to any of the gigs (well Yizi is only four) so I was absolutely delighted when Marillion said that we could come along to the sound check before the show. Anyone who has been to one will tell you that this is not some kind of private show but rather very much an opportunity to stand in a very cold hall and try to keep out of the way of people who are working to get everything ready before the doors are thrown open. So I am delighted that we managed to find a moment to get the shot shown here on the left. This is Teddy bear Steve with his pink guitar sitting on a stool in front of Steve R's peddles. Saddly he failed the audition and is not likely to be joining the guys anytime soon. After the sound check we headed off to pick up another friend who was staying in a different hotel and took him to our hotel for something to eat with other friends who were staying in the same hotel. After some terrible service that left us scrambling to get to the venue in time we arrived to find the doors open already and the support act (Sine Star Project) ready to hit the stage. This left me with very little time to sort something out. Earlier in the day they had been using a platform they could raise to adjust the lights (I'm not sure what the official name of such a things is but it has a wheeled base and a kind of platform with a scissor jack arrangement to raise the platform with). Once they were finished it was parked next to the stage and made a reasonable viewing platform. I had asked the operator if I could use it to photograph from during the gig and he was happy as long as the band were happy. So I rushed off to see if I could get permission from the band. That was also granted. But since the sound check they had built a barrier and installed a bouncer who had not been told about the permission so I had to once again find someone who could let the guard know that it would be OK.
Marillion have made a few changes to the set since last night but nothing major. However I do appreciate the addition of Thunder Fly and I'll never tire of hearing the Brave tracks Mad and The Great Escape. Again the set list was not entirely adhered to because I really do not think they did the final encore. It was pure luck that placed me on the platform just at the moment H decided to climb onto the speaker stack nearest to me. Once the show was over we were swiftly evicted from the building but we reconvened in the hotel bar where I started to upload the pictures. Sue was going to take Yizi home the next day while I went off to Tilburg for the next gig with friends. 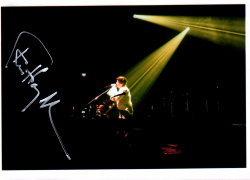 You can see the photos from the Marillion set here . The Lords are a local Marillion tribute act but I guess most of you know that already. Certainly they are known to most of the Dutch fans. 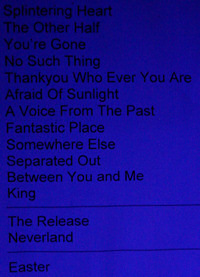 They tend to specialise in early Marillion but, as you can see from the set list, they also cover later material too. The guys had indepedantly arranged this gig to coincide with with Marillion appearing just down the road in 013. There was a reasonable turnout for the gig. Due to a slightly late start they skipped their break in the middle so that everyone could be on time for the main event. Well the gallery of pictures is here . We had arrived in Tilburg in a snow storm and headed off to find the cafe where the Lords were playing. During that show the snow kept falling and by the time we left it was looking really seasonal. The snow was still falling when we arrived at the venue and the doors were opened early so that people could come in from the cold. 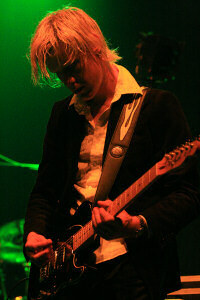 This was the only Dutch gig that was sold out and once again started with Sine Star Project. I'd spoken to the lighting guy before the gig and he told me he would be doing his best to light them nice and brightly but just to be sure I spoke to the band and in a break from my normal rules I asked to use a flash. This is often intensely annoying for the bands and I would never photograph with a flash without their permission and I always apply a filter and cut the light levels as low as possible. Judge for yourself if you think the flash helped in the gallery . The crowd really had gathered to see Marillion and trying to get around the venue to find a good spot to photograph from was really difficult. Luckily 013 has a photo pit so I was able to get some reasonable front row shots. A very similar set list to the other nights only this time it was played, as far as I can recollect, from beginning to end. There was a brief and funny interuption when the PA cut out but the band carried on playing because as far as they could tell fromt their monitors all was well. Gradually the band realised that something was wrong and the fault was fixed and they started again. Because they played the entire set list it means they played 'Happiness is the road' as the last number and it really went down well. The audience continued to sing as the guys were leaving the stage. The friends who brought me down to the gig also took me home. I have to appologise to them because I slept almost from the moment we hit the motorway until we got home. The final Dutch gig is tomorrow but the way the weather looked it seemed unlikely that I'd drive all the way to Nijmegen. The final gig of the tour and in a city I'd never been to before. Luckily the snow had melted and so I decided to hit the road. Nijmegen in the dark kind of reminded me of Cologne and that is another great city. The venue had been described as an old theatre but this was no shabby old place converted to suit the music scene. This place was still in great condition and clearly still playing to a wide variety of audiences. The Marillion set was again a full set in accordance with the set list and again the audience sang Happiness is the road as the guys left the stage. We had H climbing a speaker stack again and because Steve R's birthday is the 25th we even had a round of Happy Birthday and For He's A Jolly Good Fellow. So that is it for the Dutch tour. I think for me this was the best of the four but it is a close call with Tilburg. I can't wait for the convention but for now I'm happy to be able to take a rest and be there when our daughter goes to bed. Another year has shot by. We have the upcoming Marillion convention but other than that there is nothing planned in terms of music. Once again I've decided to dedicate an entire separate page to the convention. A great time seemed to be had by all who went and the weather once again held out for us. Nearly a year since our last Marillion gig on Dutch soil (discounting the convention) so I was really eager to see this show. And of course another reason is that this gig was so close to home being around 15 minutes away by bike (and the same distance by car actually and given the weather that's what we did). The venue is not one that is normally associated with popular music (as Marillion were categorised) but the all seater arrangement kind of suited the accoustic gig. The guys had turned up with a promissed array of strange equipment perhaps the most strange being the organ that Mark had managed to pick up. I was told that this is not the full sized monster that they had installed at the racket club but a mini version that suited the tour a little better. There was no support act so it was straight into Marillion and the difference between this and a normal gig was astounding. All the band including H simply remained seated throughout the entire gig. As one person we spoke to put it, it fealt more like a visit to the racket club than an actual gig. It was also a good deal quieter and more civilised. There was an interlude during which drinks were served but other than that nobody left their seat at any time (with one exception). And it was only at the end of the main set that people finally rose to their feet to call for an encore. I believe I might have snagged a ticket for Saturday's gig but otherwise that's it for me. Anyone who is still to go is going to have a great time. When I heard that a spare ticket was up for grabs for the Groningen gig I just had to get along to the gig. I guess I've been well and truly bitten by the Marillion bug again. We booked a hotel in the neighbourhood of the venue and drove up to Groningen on the day. A bunch of us had arranged to meet up at a pub that was coincidentally two minutes walk from the hotel. We popped in after going for a walk around the city in the rain and took a look at the venue. It was a shame about the rain because the city really does seem really picturesque. After the bar we went off for a Chinese meal and then I set off for the venue. The girl at the desk was a little suprised when I asked for my photopass. She asked me if I could name the person that had arranged the pass, I mentioned various names and she looked blank. Finally she asked "Are you here to photograph the dancing?" and "Do you perhaps want the Oosterpoort?". Aaagh damn I was at the wrong venue! No wonder there did not seem to be anyone looking vaguely like they had come for a rock concert. They showed me on the map where I needed to be and I set off and this time I got my pass with no problems. The venue appeared quite modern from the outside although the inside seems to date back to the seventies. The gig started at 8:30 so actually I'd had loads of time to get in place. 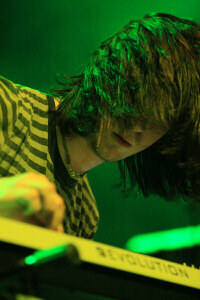 There were a number of us photographing the gig so I think you can expect to find a number of photographs out there. After the gig we set off back to the bar and were later joined by some of the crew and band members and ended up partying rather later than I'd planned. You can see some pictures from the bar by clicking on the photo. I'd been allowed to photograph Porcupine Tree in the Heineken music hall and after my allowed ten minutes were up I just decided I really had to go and pop along and say goodbye to a few people. Not wanting to leave the camera in the car unattended I took it along but with the intention that I'd keep it in the bag and not use it. I'd been to the Paard previously. To be honest it's not my favourite venue but I really like the fact that they have clearly built a really modern venue behind a preserved original facade. The lighting was a little dim but I think I managed to get a couple of worthwhile pictures after giving up on my intention not to use the camera. However twice in the same evening I've been left wishing I had a faster lens. Well perhaps a Christmas present. I managed to catch the second half of the gig and it was a similar set to the Groningen gig and seemed to be getting the same kind of reaction from the audience. However all too soon it was over and the guys were hurredly packing up to leave for France. It is a shame that this is the end of the tour for us. If you have a chance to get along to a gig on the tour then you will not regret it if you decide to go along. Sure it's not the same as the electric shows but it makes a really nice chance to see the guys doing something different and yet familiar. With one thing and another 2010 does not sound like it's going to pan out to be a big year for us and going to Marillion gigs. Friends are trying to talk us into going to London but that is unlikely. Twenty five years ago I was at university where I met my future wife and several friends all of whom seem to be raving about a band I had not heard of before. Back then the CD was a rare item and most music was distributed either on vinyl or tape. About the same time a group of Dutch guys were so moved by the music of the same band they thought it worth their time to form a fan club for the band. This evening we celebrating a quarter of a century of the Web Holland. I arrived early in Haarlem and bumped into a couple of other fans. We went in search of a bar and found they were all shut and decided to ask a local. The local turned out to be the owner of a bar and offered to open up early for us. I dropped into the venue for the sound check and checked out where I would be able to get to photograph from. The lighting was being configured at the time and I noticed that the guy running the lighting desk was the house guy and so I was curious how good he would be. A superb moment was when a fan, who was too ill to make it to the gig and had a been allowed to attend the sound check, had a song played for him. The song was not on the set list for the evening and clearly was one of his favourites, the song was 'fantastic place'. After a spot of dinner we came back to watch the opening programme. A video of past gigs, some going back a very long time, was being shown and the crowd watched and chatted. I guess for a lot of people this is going to be their only gig this year. I suspect that for me this will be the case but with the convention just around the corner we will see each other again soon. I found out that a couple of friends are going to get married on the Saturday of the convention. I had heard that sales of tickets for the gig had been dissapointing but honestly the venue was as full as could have been tollerated. The balcony was open and full and it was quite tricky getting around. I was down the front at the moment when a fan was invited on stage by the band. His girlfriend was standing right next to me at the time and clearly had no idea. She and a friend burst into hysterical shrieks as it became more and more obvious what his purpose on stage was. Well her answer was Yes, much to the delight of everyone in the audience. Well the rest of the gig went really well. I was delighted by the lighting. Not only was there a lot of light and not so much of it the dreaded red and very little strobing but it actually seemed to be really sympathetic to the music. I spoke again to the lighting guy at the end of the gig and it turned out he had requested to do this gig as he had been a fan for most of the 25 years. 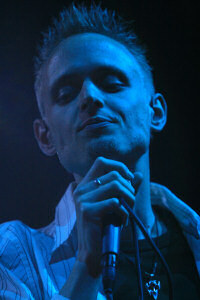 Well the photos from the gig are here. 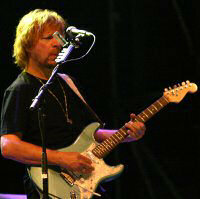 Well the guys are off supporting Deep Purple and while I'd love to go along the chances are not high. Our next get together is likely to be the convention next year. A single gig in a year is not enough for us so I hope that next year will bring something more. Sue and I are delighted to be able to finally announce the completion of the adoption of our daughter. Her name is Yizi (pronounced Yitsee) and she comes from the South of China. We went to collect her in May 2008 and at that time she spoke absolutely not one word of English. We are gradually trying to introduce her to western ways including letting her know where she can find some of the finer music. She was with us at the convention in March 2009 and had a great time. She will be with us again in 2011 but might be a little disspointed that there is no K3 convention. We recorded the video to the left a couple of years ago but we still get broad grins across our faces when we watch it. 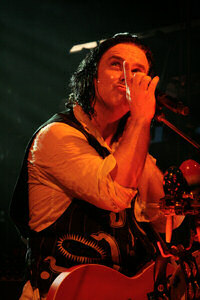 I would like to build up a link section to any one elses Marillion related picture site. 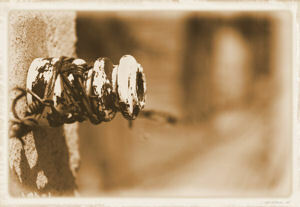 If you would like your site listed or if you find a broken link then please use the Feedback form. Station Tenderness, the web site of Maroellion. Not just Marillion but loads of music related stuff. In Dutch. 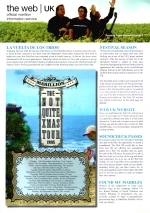 Marillion.nl Lots of links to the sites of other fans. On a separate part of the site you can download sets of images for your screensaver. This will save you the effort of downloading the images indvidually and if you have the webshots screen saver it will automatically install the new images for you. Click here to go to the downloads page.